Our barn is actually a combination of three separate pieces. 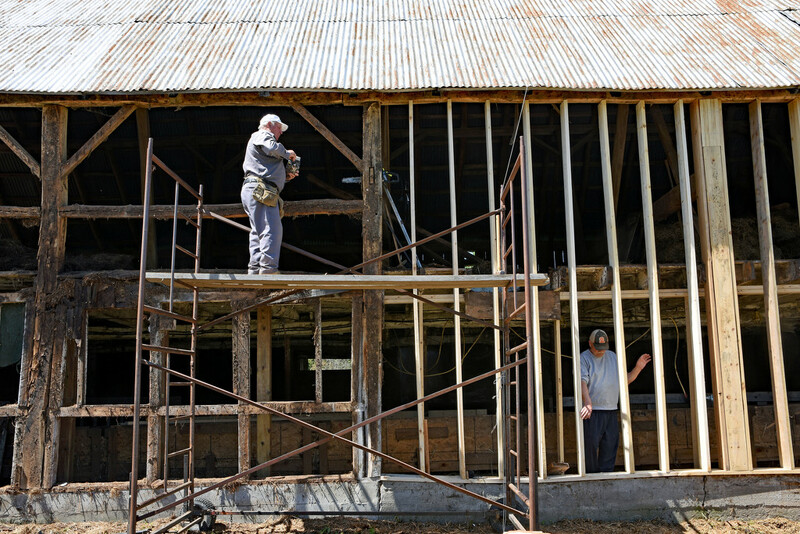 The original part of our barn is over 100 years old. We don't know when it was added onto. The combined barn then had another barn moved from another location on our farm in the late 1950's to be attached perpendicular to it. The ridge pole and rafters are in excellent shape but some of the beams were beginning to rot causing the west wall to heave out. I have a real fondness for old barns and believe they should be preserved if at all possible. So, we are fixing it. It will look so good when it is done! A great capture of the work in progress, II applaud your decision to repair it instead of tearing it down. It is so good that you preserving your old barn. I love barns too. Hope it all goes well! So much character in those old structures! Good captue of the builders.